Time is flying. I have 3 weeks until the ING New York City Marathon and I’ve just completed my second full week of training in Mammoth Lakes. This week was a scheduled down week so I recorded only a modest amount of miles, 97 to be exact. Nothing earth shattering, but after 129 miles last week, rest is more important than advancing fitness. The weather is finally coming around in Mammoth, 80 degrees with sun has become the norm. Monday: 7500ft. 9 miles AM at 7:00 pace, 6 miles PM at 7:00 pace. Tuesday: 7500ft. 4x2k with 2:30 rest. Splits were between 5:45 and 6:00 for the 2Ks, I didn’t wear a heart rate monitor or watch as the workout was relaxed and easy. Warm up & warm down. 6 miles PM at 7:00 pace. Wednesday: 7000ft. 9 miles AM at 6:30 pace, 4 miles PM at 7:00 pace. 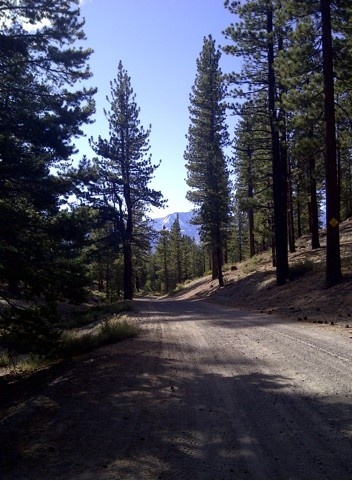 Thursday: 7500ft. 3 miles slow in the AM. 4 miles slow in the PM. Friday: 7000ft. 9 miles AM at 6:30 pace. 6 miles PM at 7:00 pace. Sunday: 7 miles AM at 7:00 pace. PM 10 games of table tennis. This is a photo of two local Vitamin D junkies, Pat Smyth and Angela Bizzarri, getting their daily UV fix on a café patio. I took this photo during my easy jog Sunday morning. Gorgeous trail.